I was well into Jack — and this whole conference kicked that up a few dozen notches — like it did everybody else — but The Chief and The Boys (the Grateful Dead) — those were the magic beans I wanted to come home with handfuls of. So I immediately parlayed myself into being Kesey’s handler — the guy who was supposed to make sure he was where he was supposed to be. Good luck with that! And then, oh man! That press conference was sumpthin! I’ll just say straight out — there are very few people I’ve been around who change a room just by walking into it, but Kesey’s one of them. This was just the first of many times I would experience it. It has to do with energy, there’s no other way to explain it. People radiate energy, and I saw the effects of Kesey’s many times. He’d enter a room, and the whole space would change, even for people who didn’t know he was there or who he was. It would get louder and more animated. He was this huge splash in the energy pool and ripples would roll across the room, hit the far wall, and come rolling back again. Mind you, he was also partnered with his Lieut. Babbs, the former Vietnam helicopter pilot and Senior Prankster who’s got a bellowing baritone to match his big Oregon frame. So . . . things change when they walk in a room. As they did to the nines in the Glenn Miller Lounge at this press conference. Lined up next to each other were Babbs, Ginzy, Anne Waldman, Burroughs and Kesey in front of the microphones and cameras and tape decks and standing-room-only reporters. The first question was to Kesey, and he was off, galloping with words and thoughts and obscure references, and leaning forward into the questions, not sitting back in his chair, and playing the room, merging the artists and audience like the best musician magicians can do. 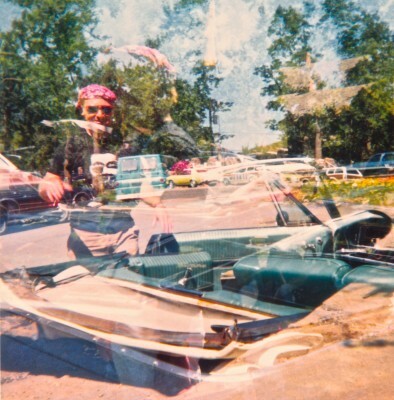 The one and only time my trusty Kodak Instamatic X-15 screwed up and took multiple exposures was with Kesey and his convertible. You can order a copy of the book from CreateSpace here . . . or Amazon here. Or you can check out a bunch of performance videos with various musical line-ups here. Or here’s a ton of different readers’ reactions to the book. And here’s a whole second round of rave reactions that came in from all over the world. For more from the Boulder Beat Book — check out Meeting Your Heroes 101. Or here’s . . . Who All Was There. Or here’s another part about Jack’s wife Edie and best pal Henri. 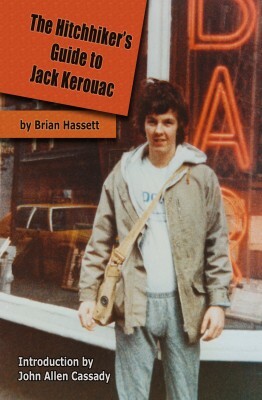 Or here’s a related Kesey follow-up story about finding buried treasure. For purchasing prints of the best photos taken at the Jack Summit, including ones with Kesey — check out the Lance Gurwell Collection. You are SUCH the Prankster!!! There is NOBODY better to have written this book!! Congrats, Bri! Can’t wait to read it!! Can’t wait to read how you fill in all the rest of the pictures. This is going to be Grate! Hopefully see you in Chicago. peace, brother. I hear something in your words about Kesey and the Grateful Dead and The Beats and what they birthed — and now it’s about selling max vip to the mainstream. I look forward to being a fan of your book. Thank you for writing it. Will get it. Perfect timing for your labor of love to come “into” the world, Brian. Long live the Bus. I was there … Naropa was across the street. Tell me more about this book. Nice! You were there?! No way! Cool! We should confab. It’s a whole book about the now-legendary summit, but also, for instance, has the most in-depth exploration in print of the connection between the Beats and the Dead. Plus transcribed conversations with many of the principals, and tons of stuff on “why Jack,” and all set in a real-life Adventure Tale featuring a bunch of people who changed history. Sounds great, I will be purchasing a copy. This is such a fine little tease — and good writing. I love “Buddhist Time”! Loved this excerpt, Brother! Congrats again & thanks for sharing the love!